Find out the plethora of Aboriginal festivals in Australia celebrating culture and art. Aboriginal and Torres Strait Islander cultural festivals have always been important community events for connecting people to place and reinforcing identity. Cultural festivals help communities grow culturally, revitalise Aboriginal cultural expression and support the social and emotional wellbeing of Aboriginal people. There are more than 130 festivals celebrating Aboriginal culture across the country. Some of them are listed below. Make sure to find out more details before you decide to attend. Note: Festivals come and go. Before you set out, check if your chosen festival still operates and if the venue and time have changed. Aboriginal Cultural Showcase runs during the Tamworth Country Music Festival (January). The 6-day community-run event started in 2008 and showcases Aboriginal musicians, comedians, performers, dance, art, textiles, weaponry, language and storytelling. See Facebook. Corroboree Sydney is held in November over about a fortnight. Aboriginal artists, writers, dancers and musicians showcase their creativity and share their stories, presented at significant sites around the world-famous Sydney Harbour. Homeground is a free festival featuring Aboriginal music and dance. The first festival took place in April 2014 at the Sydney Opera House. Indigenous Market Day is on every first Sunday of the month from 9.30am to 3.30pm at Bare Island, La Perouse, Sydney. The market includes workshops (like spear making or weaving), stalls and dance performances, including a midday smoking ceremony and welcome dance. Event poster of the Two Fires festival in 2015, designed by Franki Sparke. Red Ochre Music Festival takes place in Victoria Park in Dubbo and celebrates Wiradjuri culture. It started in 2001. Two Fires is a festival that combines activism with arts. Since 2005 it celebrates the works of the artistic community around Braidwood, NSW. It carries forward the spirit of poet Judith Wright’s twin passions, art and activism. Held biannually in April/May. See twofiresfestival.org.au. Yaamma Festival is held since 2005 in Bourke. Yaamma means 'welcome'. The festival focuses on themes of spirit, soul, heart, mind and body (October). Yabun Festival, Sydney (26 January). Drawing more than 20,000 people each year, Yabun is the largest single day Aboriginal festival in Australia. The festival started in 2003 and is renown for its impressive artistic line-ups as well as for delivering current and informative cultural programs, presenting panels and speeches by some of the Aboriginal community’s most recognised leaders, academics, politicians and artists. Yellamundie National First Peoples Playwriting Festival (Sydney, October, since 2013) is a biennial showcase for new voices in Australian theatre and a celebration of national and international First Peoples playwriting. Its name comes from the Dharug word for storyteller. Barunga Festival, Barunga. Home of the famous Barunga Bark Petition, the Barunga Festival is one of Australia's longest-running Aboriginal community festivals, celebrating its 25th anniversary in 2010. It is scheduled each year on the second Monday in June (Queen's Birthday). Darwin Aboriginal Art Fair is a 3-day event held since 2007. It's the only one where Aboriginal-owned art centres come together to sell their products directly to the public. Garma is an annual celebration of the Yolngu people's traditional culture near Nhulunbuy, in north-east Arnhemland. Mandawuy Yunupingu founded Garma in 1998 which includes a daily 'bunggul' (dance), art exhibitions and projects, a youth forum, a cultural tourism program and music performances during its five-day program, along with a key forum presentation and discussion sessions. Mahbilil Festival takes its name from the gentle evening breeze, and is held by the shores of Lake Jabiru, at Kakadu since 1990. It features traditional arts and crafts, food competitions, exhibitions and an evening program of live music and dance. Mbantua Festival, meaning "Awakening the Desert", brings together hundreds of Aboriginal performers from across Central Australia celebrating ceremony, culture, music, theatre, events, workshops, art and film screenings. The festival, which started in 2013, runs from 9 - 13 of October. Merrepen Arts Festival, Daly River, runs in late May/early June. It showcases Aboriginal designs, fabrics, an annual art sale, exhibitions, workshops, demonstrations, book launches, camp fire bush tucker, live music and a a 3-day sports carnival. Details on www.merrepenfestival.com.au. National Aboriginal and Torres Strait Islander Art Award (NATSIAA) was established in 1984 as the National Aboriginal Art Award by the Museum and Art Gallery of the Northern Territory. The Award showcases both established and emerging artists and has become one of the premier national events. The Award is also commonly known as the Telstra Award. Parrtjima (pronounced par-chee-ma) Indigenous light festival in Alice Springs (April). The 10-day festival's name means "to shine" in the local Arrernte language. The festival started in 2016 and includes light installations, film screenings, dance and music events. Details at www.parrtjimaaustralia.com.au. Tjungu Festival is on in April at the Voyages Ayers Rock Resort. Tjungu (pron. tjoo-ngoo), means meeting or coming together in local Anangu language. Started in 2014, the festival celebrates Aboriginal culture with fashion, art, sport, music and food. Walking With Spirits celebrated its 10th anniversary in 2011. The festival is held in Malkgulumbu (Beswick Falls), on the south-west corner of Arnhem Land, on the land of the Jawoyn people. The sacred site is only open to the public during the festival. Booin Gari Festival (Come This Way), started in 2008 in Tewantin, Sunshine Coast. The Murri gathering is a family day to celebrate local Indigenous culture and history through a range of creative events and performances. Cairns Indigenous Art Fair (CIAF) started in 2009 and goes for 3 days in July. It features dance, music, fashion parades, dramatic performances, workshops and artists' talks. See ciaf.com.au. Clancestry celebrates arts and cultures of the world's First Nations Peoples with a focus on Aboriginal and Torres Strait Islander peoples. Scheduled in February or October, the festival started in 2013 and is hosted by the Queensland Performing Arts Centre. See Clancestry website. Cully Fest began in Cunnamulla, south-west QLD, in 2016 but changes venues. Cully Fest is a 3-day outback and Aboriginal cultural festival that offers traditional Aboriginal dance and language, bush yarns, didgeridoo making and other workshops including songwriting and ukulele, a cabaret with bush tucker dinner, a school excursion program, National Finals Rodeo and headline musical acts. See cullyfest.com for more info. Cultural Fest. Despite the simple name this festival is held in Townsville since 1994. It is believed to be the biggest of its kind in Australia. Dreaming Festival, Woodford (one hour north of Brisbane) is the largest Aboriginal cultural festival in Australia showcasing the wide variety of cultural expression. The festival started in 2004 and features performing arts venues, bars, Ceremony grounds, traditional healing, galleries, rituals, campfire story circles and a mass of stalls, workshop avenue and food outlets. Laura Aboriginal Dance and Cultural Festival, a biennial three-day gathering dedicated to celebrating local dance and arts from across the Cape York region (far north Queensland). During the festival elders pass on the stories and meaning behind the dances and songs to the next generation. The festival was first celebrated in 1994. Lockhart Festival is a 4-day dance festival organised by the Aboriginal community of Lockhart River on the far north Queensland coast. Over 100 dancers from 8 tribal groups in Arnhem Land, Cape York, fly into Lockhart by light plane: far away from their homelands, many of the dancers are meeting other tribal groups for the first time, and new relationships are forged between communities. Stylin' Up is "Australia's largest Indigenous youth hip-hop/RnB and cultural festival" . Set in Brisbane, it started in 2001 and features many cultural and community activities alongside the music. An extensive workshop program keeps the young engaged. See www.stylinup.com.au. Spirit Festival, Adelaide, is a two-day event and South Australia's only dedicated celebration of Aboriginal and Torres Strait Islander arts, culture and sport. Tarnanthi, pronounced "tar-nan-dee", is a Kaurna word describing the dawning of the first light or a a young seed sprouting, and the name for Adelaide's Festival of Contemporary Aboriginal and Torres Strait Islander Art. It features exhibitions, workshops, symposiums and an art fair. The inaugural festival was in October 2015. Yarnballa Festival, Port Augusta. 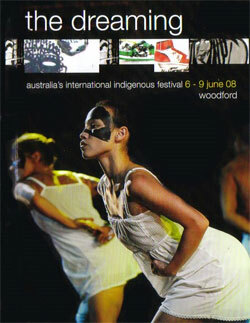 A four-day festival of Aboriginal and Torres Strait Islander culture including dance, visual arts, music, comedy and film; hosted for the first time in October 2008. Furneaux Islands Festival, held since 2014 on Flinders Island, is a lively 3-day event celebrating the culture, food and music of the 52 islands of the ‘Furneaux Group’ in Bass Strait, Tasmania. It celebrates Aboriginal music, food and arts and is understood as an alternative to Australia Day. See www.fifestival.com.au. 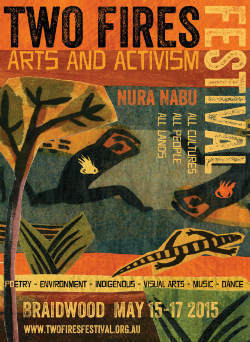 Nayri Niara (Good Spirit) Festival, started in 2009 and is held on Bruny Island featuring a series of performances, workshops, forums, healing circles, films, and talks, and a culturally diverse range of music. (April) See www.nayriniaragoodspirit.com for details. Putalina Festival, held at Oyster Cove ('putalina' in the local language) since 1984, celebrates Aboriginal culture with music, dance and festivities, and provides a platform for young Aboriginal performers. Oyster Cove was handed back to Aboriginal people in 1995. 2016 Winds of Zenadth (Torres Strait Cultural) Festival poster. Winds Of Zenadth (Torres Strait Cultural Festival) is a 4-day festival celebrating Torres Strait Islander culture once every two years during September on Waiben (Thursday Island). It was first held on 8th May 1987. The timing coincides with the transition from the dry season (Sager) to the hot wet season (Nager). Traditionally this shift in winds marked the beginning of initiation time for young men, the renewing of social relationships and engaging in trade and exchange. The festival includes four days of public dance, a street parade, market stalls and the model outrigger canoe race. Big Fella Festival is an Indigenous music festival held at the beginning of the year at Falls Creek, on top of the Victorian Alps, since 2009. It aims to showcase local traditional owner culture. Birrarangga Film Festival started in 2019 and celebrates global indigenous films that explore "humanity through family and culture". Held in Melbourne in April. See www.birrarangga.world. Black Harmony Gathering celebrates the cultural diversity in Harmony Week in March on the banks of the Yarra River. The event started in 2004. Blak & Bright, started in 2016, recognises, promotes and celebrates Aboriginal literature over 4 days. Oral storytellers, poets, songwriters, playwrights and comedians participate in panels, performances and workshops. Most events will be free. The Wheeler Centre, Melbourne (February). Deadly Funny Comedy Competition came alive in 2006 as part of the Melbourne International Comedy Festival. Contestants participate in intensive comedy workshops where facilitators help them fine-tune their acts. Note that 'deadly' means 'great' in Aboriginal slang language. Visit www.deadlyfunny.com.au for more information. Tarerer Festival Gathering of Nations, Port Fairy, 180kms west of Melbourne. 'Tarerer' means 'meeting of the clans'. The festival celebrates through dance, song and workshops on a traditional gathering site. Vibe Alive is a 2-day gathering at Mildura for young Australians of all backgrounds promoting Aboriginal and Torres Strait Islander culture and encouraging tolerance and teamwork. Yalukut Weelam Ngargee: People Place Gathering is part of the wider St Kilda Festival in Melbourne in February since 2006. The main activity is a concert and gathering with market stalls and a dance program. See ywnf.com.au. Keela Dreaming Festival is a biennial festival in the West Australian wheatbelt town of Kellerberrin featuring Nyoongar arts and culture. The name comes from 'keela', the Nyoongar totem for the Kellerberrin region. Undalup Birak Festival (formerly known as Tribal Mix) is a festival in Busselton promoting Noongar culture with cultural displays, activities, market stalls, workshops, music, dance and a contemporary corroboree on the shores of Geographe bay. Birak is one of the six Noongar seasons (corresponding to December to January). Held in January. Check www.undalup.com for details. Wardarnji Festival, Fremantle. One of the biggest Aboriginal celebrations on the Perth calendar, it gets its name from the Wardandi Nyoongar people of the south-west of WA. The festival was started in 1993 by a group of non-Aboriginal people wanting to celebrate Indigenous culture. It was preceded by traditional celebrations among local Nyoongar families . Wardarnji Aboriginal Cultural Festival is part of the Fremantle Festival where it is held since 1993 giving visitors a glimpse of Aboriginal culture on the Derbarl Yerrigan (Swan River). Vibe 3on3 is a weekend Aboriginal youth festival that incorporates basketball, dancing, art, culture and health. It travels throughout Australia and aims to promote healthy lifestyles, strengthen communities and boost self-esteem . In May 2010 it celebrated its 100th event.